Your wedding cake will be one of the crowning glories at your reception and not only do you want it to taste wonderful and be enjoyed by all you will also want the display of the cake to stand out and be remembered, as well as coordinate with your theme and personality. The tradition of the cutting of the wedding cake will leave your eyes as shiny as the flashing lights on the many cameras snapping all in the hope they click at the right moment to get that perfect photo of cake and couple. Photo albums once chosen will no doubt have a wonderful picture of you both cutting the cake and with the amount of thought and preparation that has been put into decorating your venue your wedding cake table needs to be given the same star treatment. A lot of time, thought and money will have gone into the selection of your wedding cake and it would be a shame if it was just 'plonked' down in a corner somewhere and not given the chance for the artistic beauty of the wedding cake to shine. Decorating the table to hold your wedding cake can be done in a variety of ways from simple elegance to stunning beauty. The main feature of the table will of course be the cake so don't go overboard with the ornamentation as your cake may start to blend in the background somewhat. 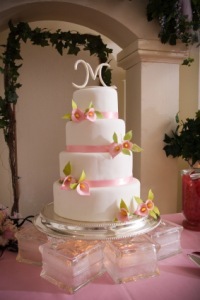 Before you choose the decorations on your cake table it will be a good idea to decide where the table is to be placed. Be sure to have the wedding cake table well away from a busy area and one that will not disrupt the flow of guests or waiters at the reception as the last thing you want is somebody accidentally nudging the table causing your cake to fall over. 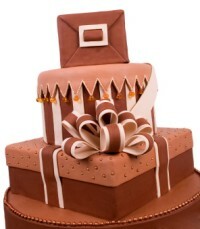 At the same time you will want your guests to see your cake so don't have it hidden away in some dark corner. Remember the amount of photographs that are going to be taken of the cake and you both cutting it so think carefully what may end up in the background of those photos. Signs such as exit or toilets will be sure to spoil that great picture. Have the table in a good position that you can both stand comfortably at the back of your cake to ensure your photographer and wedding guests get those awesome pictures. Don't place the table under any hot lights or windows that may have direct sunlight shining through. 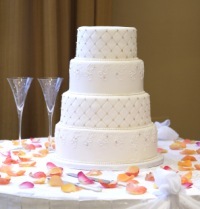 Your wedding cake will be on display for quite a few hours and you don't want to risk it melting or going soft. Putting the cake table near the dance floor could be dangerous as guests may get over zealous with their dancing and knock the table. Any table can be transformed just by placing a tablecloth over it. White or ivory tablecloths can look stunning and elegant without taking away any of the beauty of your wedding cake and colours that match your bridesmaid and groom's outfits or wedding decor can bring out the simplicity and class of even the plainest of cakes. Tulle can be draped around the edges of the tables and white lights, flowers or greenery can be added to the tulle. Your pew bows can be attached around the edge of the table and left to drape over the side. Tulle or satin table skirting is a beautiful way to add a delicate look to the wedding cake. Strips of ribbon that coordinate with your chosen colours can be added. Four tall columns can be placed around the cake table creating a stunning display area. These columns can be decorated with white lights, flower displays, strings of pearls and diamantes, tulle and/or ribbons. A canopy of netting can be placed over the columns with twinkling star lights. Place speciality background lighting behind the table or give a romantic glow from lights placed under the table and shining through the tulle or tablecloth. A piece of glass placed on the table can have matching flower petals from your bouquet. Your cake table can have a multitude of decorations placed on it but remember your cake is the star and sometimes less is more beautiful. Photographs can be placed next to your wedding cake of your engagement, parents cutting their wedding cake, baby/children's photos of either yourselves or your children or a loved one who is no longer with you. Scattered rose petals or loose flowers that match your own bouquet or complement the cake. Rose Votive candles with coloured confetti and/or diamantes or pearls. Cake toppers matching your personalities or relate to your jobs, a favourite sport or hobbies. White snowflakes and pearls for that winter wedding theme either on their own or have a dash of colour added from your bouquet selection. Personalised wedding cake knife and server with toasting glasses entwined with ivy leaves and ribbons. Your bouquet, the bridesmaids bouquets and/or the throw away bouquet if you have one. Your framed wedding invitation and save the date cards. Silver candelabras with either white or contrasting wedding coloured candles. Roses and ivy can be wrapped around either the candelabra and/or the candles. For that Christmas wedding you can use decorations such as holly with red or tartan bows, pine cones, tiny oranges and fake snow with snowmen that can have hats and scarves the same colour as your bridesmaid dresses or grooms waistcoat. 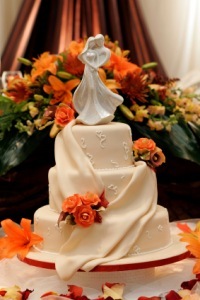 Autumn wedding cake tables can have tiny pumpkins, dried leaves, and berries scattered around. Summer weddings can have a multitude of different coloured flowers especially roses, tiny sun shapes and yellow ribbons. Why not create a collage of important dates to you both such as old concert/theatre tickets, photos, plane tickets, picture of where you met and build up a story your guests can relate to. Surround your wedding cake with corresponding symbols such as poker chips and cards for that Vegas-style wedding and seashell with starfish and netting will be perfect for that beach or seaside theme. Anything that is special to you or your parents can be engraved with ribbons entwined. Before you even consider how you are going to display your wedding cake you must take into consideration what the size of the table is going to be. The base of your wedding cake will really determine what size to use. Choosing a large round table can make a cake look much smaller. If your cake is a themed large one you will need plenty of room on the table for any items you want displayed with it. Make sure the table is sturdy enough to take the weight of your cake and the pressure of it being cut. Any type of adornments can be added to your cake table, there is no limit on what selection you choose and you can be as bold or plain as you like yet at the same time remember to take into consideration what could happen to your table if enough thought is not put into it. Don't place the guest book on the same table as this could result in your wedding cake being knocked over while people try to sign the book while leaning on the table. If you want lighted candles placed around your cake remember to double check for safety and sturdiness. Your wedding cake is one of the most symbolic and traditional parts of your reception and represents the first shared task between man and wife with the cutting of it and the wonderful piece of art you choose deserves to be displayed in all its glory and magnificence.